Living in an apartment with small children can be challenging. Between the toys and all the extra baby furniture, it is hard to create a comfortable space for yourself. 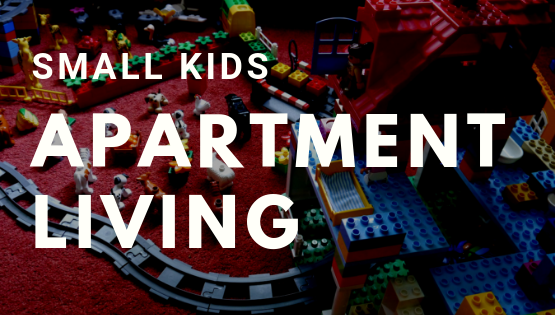 If you are worried about how your family will adapt to apartment living with small kids, here are a few tips to help you maximize your space. The minimalist lifestyle isn’t right for everyone, but it can make a big difference when you’re living with limited space. The less stuff you have cluttering your apartment, the more you can open up the floor space and breathe. Stay on top of clothes and toys, donate the ones that you don’t need, and try not to let excess build up around you. There are tons of minimalist blogs written by moms that are perfect to help you get started. How much time do you really spend in your bedroom? If you’re like most people, you spend the majority of your time in the living room and kitchen, while your kids are more likely to spend their time playing in their rooms. With wall mounted and hideable storage solutions, you can turn your bedrooms into multi-use spaces without the mess. For instance, fold down desks are a great way to turn your room into an office space in just seconds. Birthdays and holidays are typically one of the biggest challenges when it comes to living in an apartment. This is when your kids will start bringing home gifts, cards and other items from school and from family. While all of these gifts are well-meant, they can certainly cause frustration. Consider pre-empting this by asking for gift cards to local amusements parks, museums or other attractions that will create great experiences without bringing more stuff into the house. The good news is that Pinterest and furniture designers alike have made a point of offering better options for organization these days. From storage cubes to floating shelves, now is the time to start designing your space with organization in mind. You can even make beautiful storage on a DIY budget! Implement a system for keeping things clean, and get your kids on board by color coding and labeling things. Even toddlers can learn how to stay organized if you give them enough visual cues. Living in an apartment doesn’t mean you have to be trapped inside. As you search for apartments for rent, make sure you choose a location that has plenty of outdoor amenities for your kids to enjoy. A park or playground nearby will help you get out of the house and miss the cabin fever. The whole world is out there to enjoy, and you can reserve your apartment for relaxing and cuddling in the evenings. Just remember, Sugarloaf Apartments are just a few blocks from the nearest beach, and they have a pool in the common area for you and your kids to enjoy! The Destin area is the perfect place to search for apartments for rent when you have small kids. There is plenty to do in and around the city so you can make the most of the outdoors as well as birthdays and holidays to get out of the house. There are also plenty of spacious apartments for rent that will give your kids room to store toys and play indoors when necessary. For more information, contact Sugarloaf today.